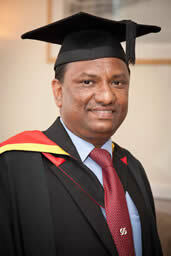 "I am very proud of the extraordinary experience of The Chartered Banker MBA Programme. From the onset of my 12 month sojourn in the Super Accelerated Route, the level of student support provided by the professors and the Administrative Team, was absolutely phenomenal. As a busy CEO of a rapidly expanding commercial bank, I valued the unrivaled flexibility of the programme and the direct relevance of the knowledge gained to my day to day operational engagements. My high expectations were surpassed, and now I feel really accomplished with the professional designations of Chartered Banker and MBA in Banking and Finance. With my professional experience of 16 years as a central banker and 5 years as commercial banker, the CBMBA achievement completes my credentials as a subject matter expert in banking." "The programme provided a broad range of topics to choose from enabling me to tailor my studies to my own and my employer’s needs. All topics were relevant to the challenges current in our industry and therefore suitably challenging to study too. The tutors were excellent and they were supported by comprehensive and thought provoking materials. The Webex live tutorials also meant that knowledge and preconceptions could be debated amongst peers with almost all of the benefits of a “classroom” group. Our industry is changing at a faster pace than for many years and it can be tricky keeping up, never mind getting ahead. The course therefore helped me to keep my personal development aligned with the most important aspects out there. The course has also been beneficial in career terms as I was able to select modules that are of value to my employer and to my role there. This has ensured that gaining the MBA wasn’t just an academic exercise, in either sense of the expression. Absolutely, I would recommend the course. Indeed, I think the emphasis ought to be reversed and we ought to be challenging our peers as to why they wouldn’t want to pursue the course and its aims." "The MBA (Chartered Banker) program was a fantastic and exciting learning experience for me, which enhanced my banking knowledge significantly specially in the areas of Risk Management, Credit & Lending, Financial Crisis Management, Professional Ethics and Regulations. Throughout the program I enjoyed modern delivery methods such as webinars, electronic media based communications via university’s intranet and email and online workshops in addition to the traditional methods such as face to face learning, text book reading and classroom discussions. MBA (Chartered Banker) program has become a beginning of a new chapter in my career with higher responsibilities which demands logical judgements supported by critical thinking. The knowledge gathered and the experience gained throughout the MBA (Chartered Banker) program has enhanced my ability to analyse a situation critically and find a suitable solution for a problem, which is vital for the survival in the modern highly competitive business environment. "Combining study with a day job in banking brought the subject matter alive for me and really helped to develop my views on the competitive landscape and strategic challenges facing my own employer. The support provided by Bangor University was first class with the lecturers demonstrating a real desire to support the students in getting to grips with the subject matter. I particularly enjoyed the revision sessions at the Bangor Management Centre, which enabled students to study and socialise in a modern purpose built facility. I feel more informed across a wider spectrum of business and strategic issues, which has helped me in the leadership aspects of my current role. The Chartered Banker MBA qualification is not a guarantee of success in its own right but it does demonstrate a level of professionalism and commitment to the banking industry and I feel more optimistic now about my future career prospects than I did a few years ago. For those looking to progress to managerial positions within banking or the wider financial services community, the Chartered Banker MBA is a course that I would thoroughly recommend." "Jennifer Mallon is a full time relationship manager with the Chartered Banker Institute and she decided to take the qualification after a number of years of in-house training and financial adviser qualifications with Clydesdale Bank in order to receive global recognition for her knowledge. “I was pleasantly surprised that the actual learning required 7/8 hours a week for me and not the 15 indicated as the norm”. Jen was eligible for the accelerated programme and has chosen International Banking as one of her electives to broaden her awareness in this specialised field"
"Joseph Healy is the Group Executive for National Australia Bank with responsibility for their largest division in Australia – Business Banking. Joseph was very positive about all aspects of the programme, but particularly he commented on the “depth” of the material and cited the example of how the programme had helped him prepare for Basel 3." "George is the Risk Compliance Manager with NBS Bank Ltd, Malawi. An alumni of Bangor Business School with eight years industry expertise, he joined the CBMBA in January 2011. George chose the CBMBA due to the specific structure of the banking and finance expertise delivered by Bangor Business School. He commented that due to recent updates in regulations through the Financial Services Act in Malawi, he will be better placed and prepared for the change. “the learning offered through the CBMBA will give me the opportunity to network with global banking professionals and has increased my confidence in banking issues"
"George, the Chief Credit Officer at the “Opportunity International Bank of Malawi” found the Chartered Banker MBA through the web – when he decided that he wanted to earn a specialist banking qualification to support his first degree and enhance his banking career.. He decided on the CBMBA because he wanted an in depth understanding of his chosen modules and an international perspective of the banking industry in general and he was very happy to report that the programme so far had delivered this. "Ben Anwuri is Deputy General Manager/Divisional Head, Operations, at Finbank Plc in Nigeria with responsibility for overseeing Domestic and International Operations at the Head Office as well as Banking Operations in over 180 branches spread across Nigeria. He is an Honorary Senior Member of Chartered Institute of Bankers, Nigeria (HCIB), with 19 years of banking experience spanning across credit and marketing, bank auditing/compliance and operations. Ben was attracted to the CBMBA due to its dual qualification being offered and the course content which offers up to date knowledge and skills relevant to current global trends enabling him to have a global perspective to issues. 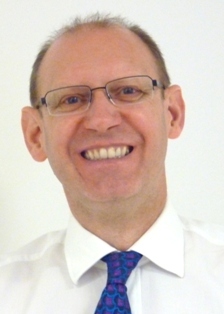 "Michael manages Divisional communications for Lloyds Banking Group and has 6 years industry experience. Joined the accelerated route of the CBMBA programme which was featured in the Chartered Banker magazine. "Ross is an Associate Director with Bank of Scotland, having run the LIBOR Liabilities Treasury Team in Scotland for Lloyds Banking Group since 2009. "Being in an HR role, Julie did consider that a Chartered Institute of Personnel & Development (CIPD) qualification would be her next, natural step in her professional development – until she saw the supplement in the Chartered Banker magazine describing the CBMBA. Once Julie began working through her materials and participating in the webex online tutorials she recognised how the “journey” really helped her to appreciate the major changes her organisation had been through and how best to handle the challenges ahead"